Looking to invite your guests to your wedding with something a little different? This invitation from Hip Hip Hooray features a beautiful floral pattern, a romantic typeface and a modern striped header for that all important eye catching look. Known as ‘toile’, the classic floral design is a quintessentially French pattern that you’ve probably seen before on plush cushions, curtains and fancy bedspreads in gorgeous country homes. The handwritten-style font adds a lovely romantic feel, perfect for a wedding invitation! Below your names and the declaration that you are getting married, the rest of your details are professionally printed in a smart modern font that adds a contemporary dimension. You will have noticed at the very top of this invitation the chic striped header and the length of twine that acts as the start of your details. 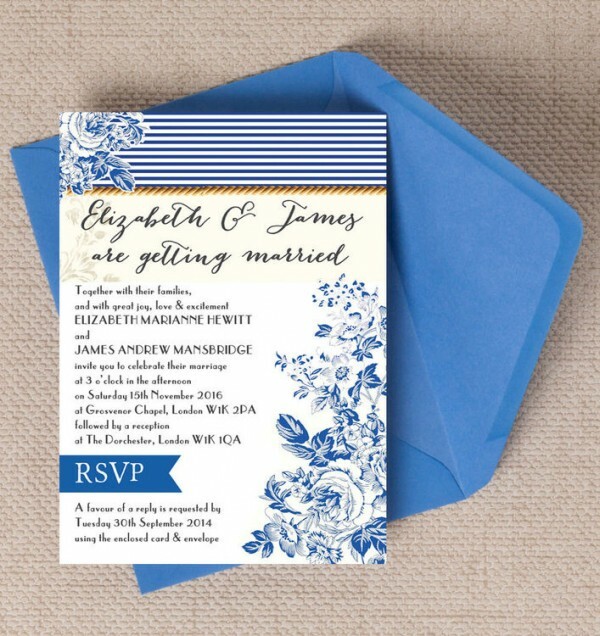 We love this part of the design because it has a very stylish nautical feel, meaning it has the versatility to fit into a range of wedding themes; from country house French elegance to naval heritage, we’re sure you can take aspects of this design and incorporate it into your big day very easily. Super-Luxe Pearlescent Card as well as the option to choose coloured envelopes of your choice, you really can add your own special touch for a truly memorable and beautiful invitation. Tags: Chic, French Toile, na, Nautical, Romantic.